Editors' Picks: 20 of the Best Things to Do in Arkansas! Arkansas is perhaps best known as the home to both former President Bill Clinton and the retail giant that is Wal-Mart. But it’s also home to hot springs with healing powers, a stop on Bonnie and Clyde’s crime spree, and the Dover Lights (a mysterious phenomenon reported to be caused by the ghosts of Spanish conquistadors looking for their lost gold in the Ozark Valley). In addition to the above freaky attractions, Arkansas, known as "The Natural State," has so many interesting things to explore - here are 20 of the coolest things to check out. The Eureka Springs & North Arkansas Railway is a fun way to explore portions of the Ozarks. Their Eurekan Dining Car makes it even more fun, as you savor a delicious meal in 1920s style while the scenery clicks by. This unique glass (6,000 square feet of it) and wood building, nestled in the woodlands, was chosen as one of the "Top 10 Designs of the 20h Century" by the American Institute of Architecture. No matter your religious denomination (or lack thereof), it’s a serene and beautiful experience. 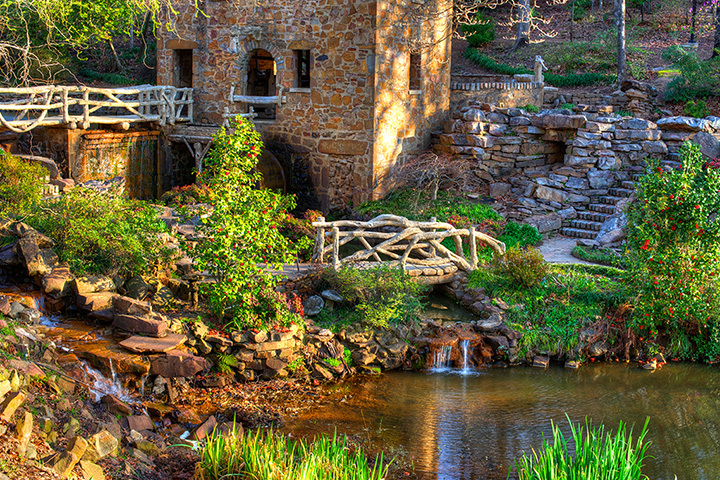 It’s 210 acres of sheer beauty, including streams and waterfalls, Daffodil Hill, the Garden of the Pine Wind, bird sanctuary, and a children’s garden, all located in the Ouachita Mountains. It’s a fantastic place for photos. This gorgeous 198-mile stretch runs through highlands, past a national forest, several state parks, historic sites - even a former home to Ernest Hemingway. Plenty of interesting places to stop and explore. It’s one of the last antebellum mansions on the Mississippi, built in 1859 and restored in the early 2000’s. The home is a fascinating museum, with many artifacts discovered during the renovation. In 1815, surveys of the Louisiana Purchase Territory began here, helping to drive America’s expansion into the West. As you stand in front of the marker, you’ll feel history all around you. Starting in 1935, the legendary country singer grew up in this home - which was a part of a farming community begun by Franklin Roosevelt to offset the Great Depression in the area. The home preserves many of the influences that would go on to shape Cash’s music. If you’re a fan of "Gone With the Wind," you saw this water-powered grist mill in the opening credits of the 1939 film. It’s thought to be the only remaining building from the movie, and is listed on the National Register of Historic Places. One of the largest lakes in the Ozarks region offers plenty of summer fun, from boating to scuba diving, camping, fishing, hiking and more. Dive in! Native Americans have long believed the hot springs to have healing properties. Take a dip in any of the many preserved pools and see how it affects your aches and pains. There are also vintage bath houses, walking trails and an observation tower. Since its founding over 50 years ago, this October event has become one of the largest arts and crafts fairs in America, attracting attention from national publications like The New York Times. One of the coolest things are the local Ozark craftspeople who display things like weaving and rugs as a way to preserve tradition. This impressive underground cave system features lighted walkways that allow you to fully take in the amazing rock formations and "rooms" (one as big as six football fields). You’ll feel like you’re on another planet. Arkansas is considered one of the best places in the world for finding all kinds of quartz crystals. Join the "rockhounds" at the various dig-your-own crystal mines around Mount Ida, and take home your own little piece of metaphysical magic. Housed within a 1940s’- era aircraft hanger are many fascinating examples of flying machines dating back almost a century. The collection includes some of the last surviving aircraft from several wars, the Golden Age of Aviation, air racing and more. The Ozark Mountains are one of the most distinctive areas of America. This museum beautifully honors the history and legacy of its people and contributions. There are many interesting historic buildings on the grounds, including a log cabin and doctor’s office from the 1800’s. These gorgeous birds flock to Magness Lake around the holidays and hang around through the middle of winter. What a beautiful sight. It’s one of the most complete portraits of Native Americans in North America, as told through arrowheads, woven items, knives, pottery and more. One of the most fun things about the place is the "arrowhead search" and teepee just outside the entrance. Kids will love it. Take your pick of walking or cycling across the longest pedestrian bridge in America. It looms 90 feet above the Arkansas River, and spans 4,226 feet over Murray Lock and Dam. Make sure to take pictures to capture the views. In the 19th century, elk were ubiquitous in the mountainous parts of Arkansas, before becoming nearly extinct. Since the 1980s, they’ve been re-introduced to help with the local ecosystem. The Buffalo River National Park is a great place to spot these glorious creatures (males can weigh up to 700 pounds). Surrounded by 120 acres of gardens and forest, the building itself is pretty awesome - but what’s inside is exceptional, too. You can explore five centuries of American art, starting with Colonial times. A lovely place to relax after the holiday madness.